Recently I was facing a badminton dilemma. Over the years, I have accumulated quite a few dozen rackets in my collection. And while a lot of them were stringed, I have been breaking strings quite often. Often enough that I was starting to run out of stringed rackets. With myself and wife requiring almost 10 to 15 restrings every year, at a cost of $15/racket labor, it is starting to add up. 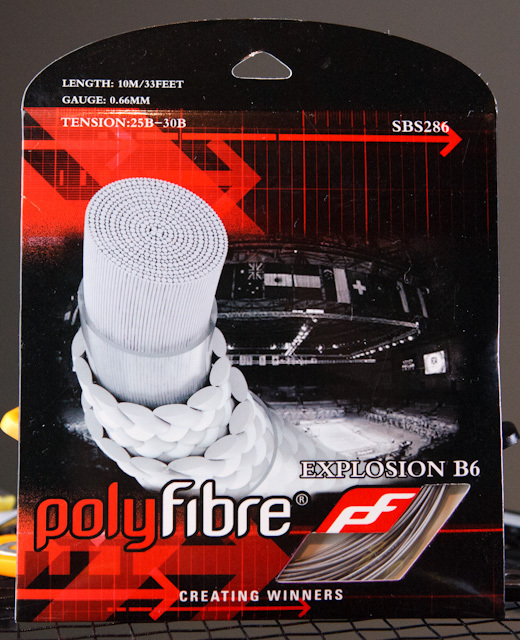 On top of that, BadmintonCentral.com is now actively seeking review samples from manufacturers for review, the number of stringing we need will escalate by a lot. Therefore, a new stringing machine is direly needed. The choice of stringing machine for me is a difficult one. Many factors came into consideration. I am only a recreational stringer, it makes little sense to get any machine that cost thousands of dollars; however, at the same time, i had used less than stellar machines before and I do appreciate well engineered and well built machines before; and of course, there is the field of mechanism like drop weight, crank, electronic; 2/4/6 point mounting; badminton / general purpose; and fixed / flying clamp. each factor has their pros and cons as well as cost that associate with them. After consulting with the experts in the field, I ended up with an Alpha Shuttle Express. And as it turned out, I have made a very good choice. 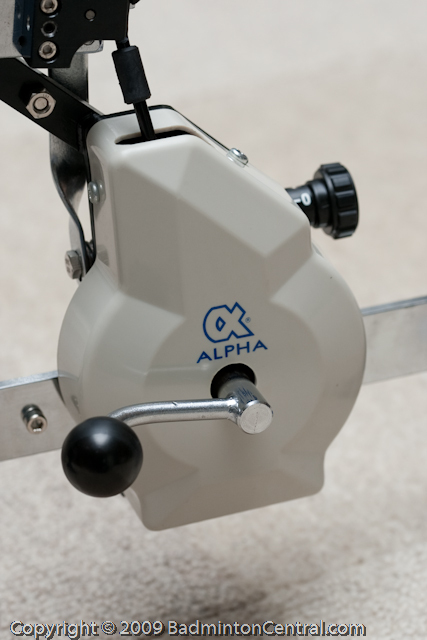 The Alpha Shuttle Express (ASE), as the name hinted, is a badminton specific machine. 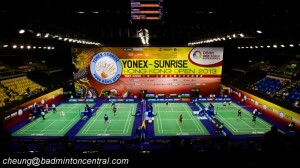 In other words, the dimensions are designed for badminton racket stringing only. The advantage of such a machine are as follows. 1) without having to deal with gigantic tennis racket, it is very compact and light weight. 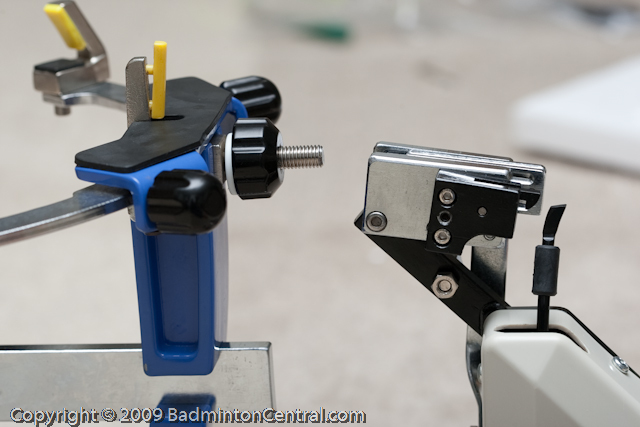 2) As it is sized for badminton, the clamps are positioned specifically to support a badminton racket optimally. 3) the tensioner is positioned very close to the racket frame, minimize any string wastage. The ASE has a 6-point suspension support system. Two suspension mount for the 6/12 o’clock positions and 4 screw adjusted swing arms with metal V-support at the 2/4/8/10 o’clock positions. 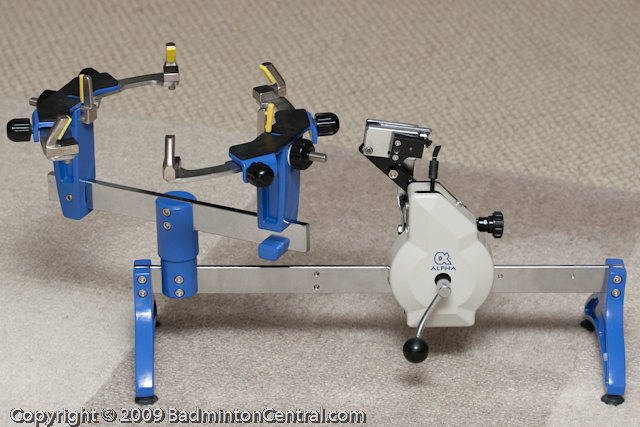 The ASE employs a flying clamp system with two supplied Alpha badminton flying clamps. The turntable sits on a ball-bearing loaded axle. A crank tensioner allows adjustable tension between 10lbs and 36lbs to be applied to each string. 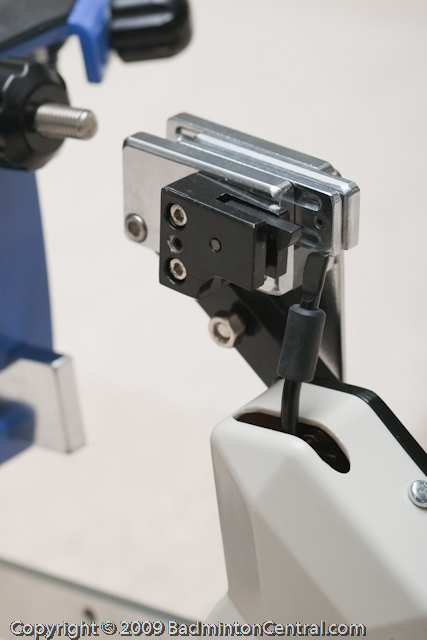 The locked out based tensioning mechanism grips the string with a metal gripper. In other words, this is not a constant pull machine. 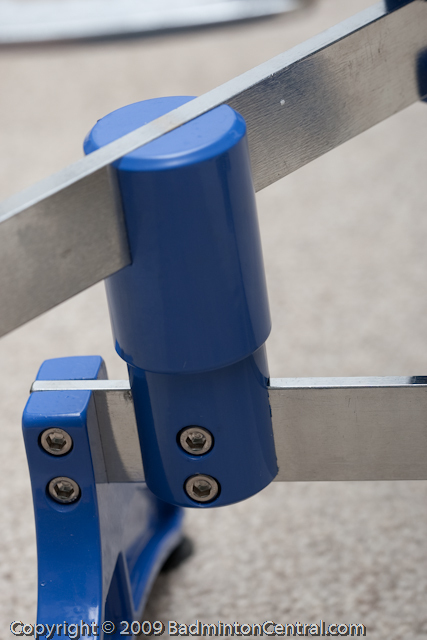 The tensioner rides linearly on a metal glide bar and supported by ball bearing for smoothness. 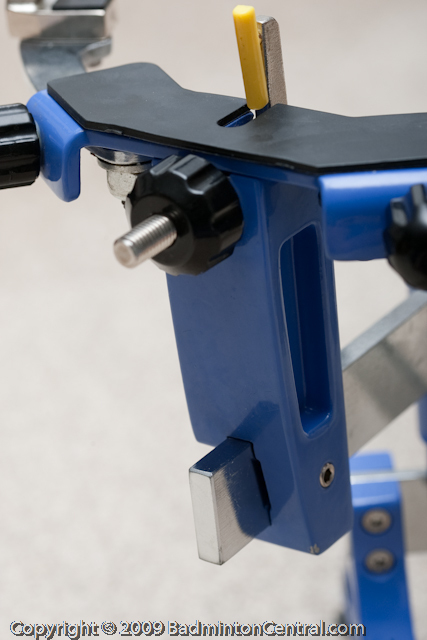 The metal glide bar also serves as the main body of the machine where the turntable also sits on. Two forged metal feet with rubber suction cups allow the ASE to sit securely on any smooth table surfaces. The overall design of the machine is really quite pleasing. The main color is sky blue and gloss silvery metal with black and yellow accent. I have strung 1/2 dozen rackets since I received the machine. My overall experience with it is very positive. The size and cost of the machine is quite ideal for my use. 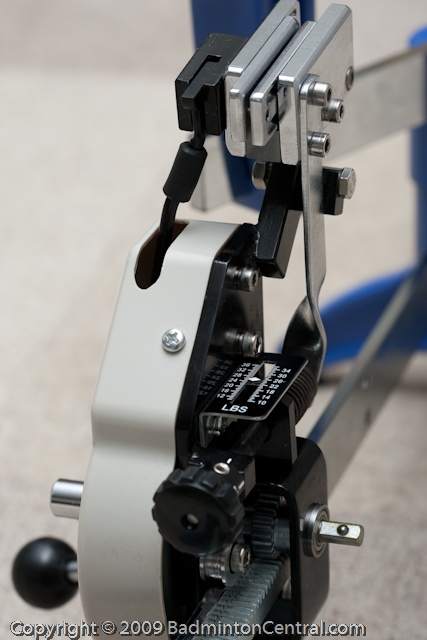 With the current market price of US$350, it is affordable when it come to stringing machine. Most larger tennis capable machines are at least that much. The machine weighs around 20 lbs total. The light weight is due to the relatively simple and minimalist design, there are no complicated oversize turntables, nor are there extra accessories like a large stand nor tool trays. The six point mounting system is very effective. The swing arms are rock solid. One of my test was to string my Cab20 to 34x36lbs, the swing arm held their grounds and didn’t budge. The 12/6 o’clock support, however, has a big drawback that begs for improvement. the way the support are designed, they do not hold the racket down and it is very easy for the racket to slide out of the support during stringing. when tensioned, the support are push together and they formed a slanted angles that is not secure. It is ok when the side supports are used as they do effectively help holding the racket down. The side V-support, are rock solidly strong and sturdy with metal structure and plastic padding for protection. It provides a lot of confidence that it will never break. However, I have find that the V angle is not optimal enough to allow for easy access to the grommet. It can be frustrating if the grommet is right in the middle inside the support. Initially, I had reservation regarding the turntable. In the marketing photos, the turntable do not look very substantial. However, my 34/36lbs stringing test shows that my suspicion was unfounded, even when pull directly sideways, the total lean of the turntable was at most 1-2 millimeters. Hardly a concern. And even when under such force, the ball bearing pivot was moving very smoothly. This is top notch build quality. The turntable do not have a brake. 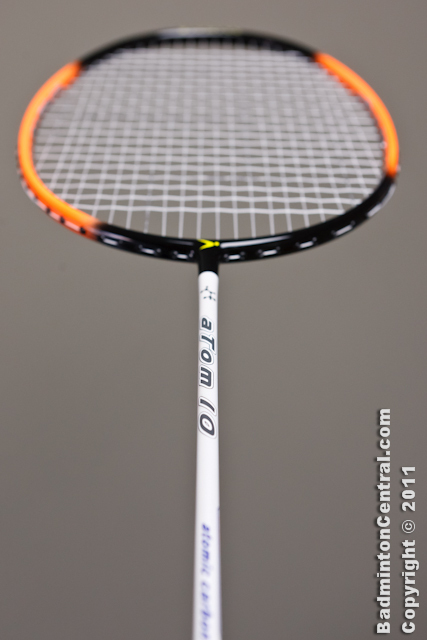 this is slightly inconvenient when weaving or stringing the Prince O3 racket. However, this is not a deal breaker. 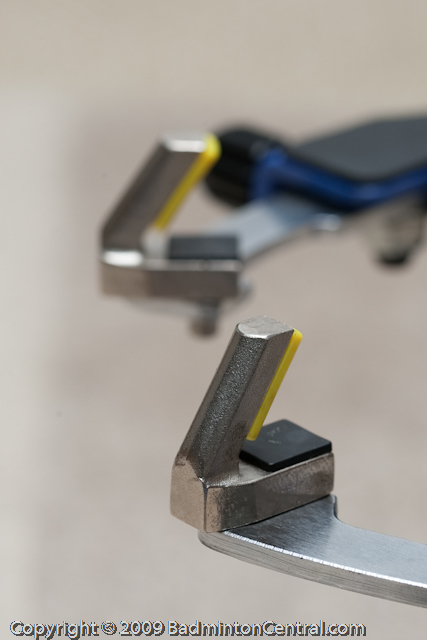 As the ASE is a pure flying clamp design, two Alpha flying clamps are supplied with the machine. 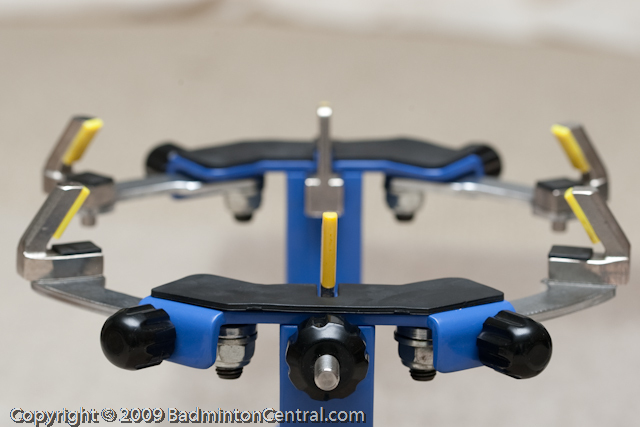 The badminton specific flying clamps are similar in idea as the popular Yonex flying clamps. They are a bit larger than the Yonex ones and similar in size to the Hi-Qua ones. The Alpha clamps hold tension really well. I had no problem with it holding 36lbs. The clamp is also easy to engage and dis-engage. The Alpha clamps have a few drawbacks. Firstly, the fingers are not optimally spaced for the typical cross strings. Secondly, the separation for the two string is also not spaced for the cross strings. Thirdly, the middle clamp block is not tapered/angle for easy insertion. These few factors together make them a poor choice for clamping the cross string. The string gripper is excellent. They are located below the turntable surface, sitting below the racket’s swing plane means that it allows for 360 rotation of the turntable. The gripper itself is very tight. I never have a string slip on me. The crank tensioner rides on the main support rail of the machine. The tensioner is a locked out mechanism. The tension range supported by the ASE is 10-36lbs. which is more than adequate for 99% of all badminton uses. in fact, the tensioner should go up another 2 pounds beyond the end of the scale. One would have to extrapolate the tension by the dial. The whole tensioner rides on the main rail with ball bearing. Even when going at maximum supported tension range (ie. 36lbs), it is a very smooth operation. The lock-on engages very fast and slippage free. However, the tensioner does need to be manually pushed back to its starting position like other crank machines. I have not purchase any calibrator scale so i cannot judge the accuracy of the default calibration. The ASE weighs around 20lbs. It is not a lot of weight thanks to the minimalist design. The advantage of which is the portability. I have no problem carrying around my house up and down stairs. In fact, in the old ASE, a portable case is provided. However, it also means that any large external force can potentially tip the machine over, so extra care when pulling that stubborn cross string with a string mover. 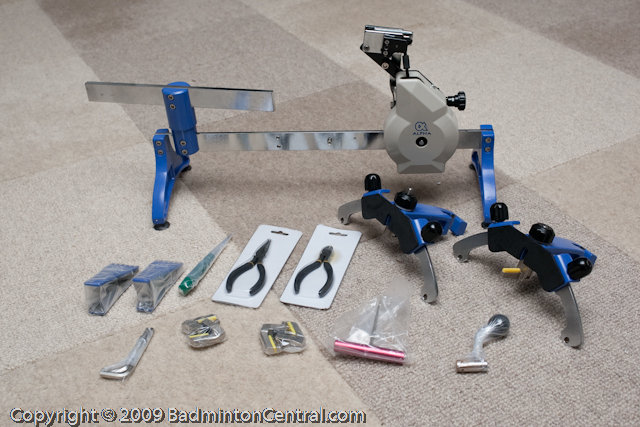 As part of the package, the ASE comes with a full suite of stringing tools: a string mover, a badminton sized awl, a long nose plier, a string cutter, a full set of allen keys for assembling and servicing the ASE, a pair of badminton flying clamp, and a set of spare padding for the mount and clamps. This is really nice addition as all those tools will easily add up to a good US$75. This in itself makes the machine quite a bargain. The Alpha Shuttle Express is a very badminton specific machine that will suit any badminton enthusiast who wants to do their own stringing. It will be suitable for anything up to medium duty stringing. Retailers who performs dozens of rackets a day might want to look for alternative professional machine. The ASE while compact and light weight is an extremely well designed and well built machine. The operation is simple and smooth. It is absolutely solid beyond its tension range. There are a couple of minor shortcomings like the suspension mount and the less than ideal flying clamps but none of which are deal breakers. For the cost of US$350, it is a great buy. I give this machine a 9/10.